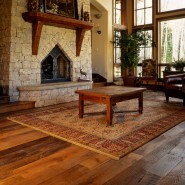 When address wood floors cleaning in this article, we are discussing only sealed wood floors in residential homes. Any form of moisture from water on a bare, unsealed wood floor will damage it immediately and should be avoided at all times. With that said, the goal of this article on wood floors cleaning is to provide the residential end-users of how to effectively clean wood floors with a common cleaning agent found in most homes and is inexpensive, in fact it is cheap. The cleaning agent is baking soda. When a residential end-user combines using baking soda with a microfiber flat mop to damp mop wood floors, excellent cleaning results can be achieved at a fraction of the cost of using popular branded floor cleaners. The combination of this these two items allows the residential to clean wood floors on a routine (at a minimum once weekly) to keep wood floors clean on a consistent basis. Arm & Hammer Baking Soda is the most well-known name in baking soda and Bona or Swiffer Microfiber flat mops is a good choice for the mopping tool. An additional goal of this discussion is to provide our visitors with the routine cleaning steps for wood floors cleaning. I would caution our readers not use vinegar, bleach or ammonia when cleaning wood floors. These types of common household items are also inexpensive but these items can actually damage the seal of the wood floor with continued use. Additionally, if ammonia and bleach is mixed intentionally or by accident, it will create a lethal and fatal gas that can kill people in moments. In the event you were more interested in cleaning wood floors with traditional cleaners and tools, please click on the following link (How to Clean Hardwood Floors – Simple Regular Cleaning). Most importantly always remember when it comes to wood floors cleaning….wood hates water, so only damp mop the wood floor using the least amount of moisture on the wood floor. Dust mop the wood floor to be cleaned. Mix 8 to 16 ounces of Baking Soda with a one gallon of warm water. Soak the microfiber flat mop in the baking soda cleaning solution and squeeze or wring the mop out until damp and is not dripping with water. Using the microfiber flat mop, manually damp mop the wood floor until entire wood floor is cleaned. Allow the floor to dry completely before allowing foot traffic on the floor. If the correct amount of cleaning solution has been applied through the damp mopping process, the floor should be dry within 1 to 2 minutes.